Our office will be closed Thursday, November 24th (all day) in observance of Thanksgiving Day. We will reopen on Friday, November 25th, at 8:30 am. IMPORTANT NOTE: All conferees, their families, and guests must book their cruise within the University at Sea® meeting group through University at Sea® at 800-926-3775 or by registering online. This ensures our company can provide conference services and complimentary social amenities to all meeting participants and their guests. Thank you for your cooperation. 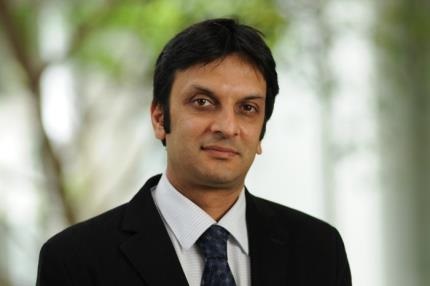 Dr. Patel received his Medical degree from the University of Southampton, United Kingdom and completed his clinical fellowships in Internal Medicine and Gastroenterology/Hepatology in Western Australia. He received his PhD from University of Sydney. He completed a 3-year post-doctoral research fellowship in Clinical and Translational Research in viral hepatitis at Scripps Clinic and Research Foundation, San Diego, CA and Duke Clinical Research Institute, Durham NC. He was on faculty at Duke University 2004-2015, and is now at University of Toronto since 2016. His research interests include early phase clinical therapeutic trials for viral hepatitis and NASH fibrosis, and the development non-invasive biomarkers of fibrogenesis. Dr. Poleski is currently Professor of Medicine at Duke University in the Department of Medicine, Division of Gastroenterology, Duke University. He was Chief of Gastroenterology at Duke Regional Hospital (DRH) and Director of the Endoscopy from 2008 to 2016. Dr. Poleski created the modern DRH Gastroenterology Department, starting with one Gastroenterologist in 2008, and now includes 8 Gastroenterologist. He is currently a full time Professor of Medicine at Duke University with a full time practice at Duke University clinics and endoscopy centers. Dr. Poleski graduated McGill University, Montreal, in 1973 with an MD. He did his Internal medicine training at The University of Toronto and McGill University. In academic year 1975-76 he was Chief Medical Resident at The Jewish General Hospital of McGill University. He did a fellowship in Gastroenterology at Memorial Sloan Kettering , part of the Cornell Hospitals in New York City. After completing his fellowship he returned to the Jewish General hospital as a consultant in Gastroenterology, developed the first Inflammatory Bowel Disease center at that hospital and at McGill University. He eventually rose in the ranks to become an Assistant Professor of Medicine at McGill University. He joined the Scripps Clinic Medical Group in La Jolla , California at the end of 1992 as a consultant in Gastroenterology. He subsequently became Director of the Inflammatory Bowel Disease Center and Director of the Fellowship program in Gastroenterology and Hepatology at Scripps clinic. He also had an appointment at UCSD as Clinical Professor of Medicine. In the summer of 2003 he joined the faculty of Duke University as Professor of Medicine and senior consultant in Gastroenterology. He has continued his interest in inflammatory Bowel disease (IBD), involved in clinical studies and having a clinic at Duke University Medical Center dedicated to IBD. To share on going changes in treatment of Crohn's disease and Ulcerative colitis. Barcelona is a one of the world's great cities. Stroll down her tree-lined boulevards, the magnificent Passeig de Gràcia or the more touristed Las Ramblas. On the Passeig, shop a serious fashion district while marveling at examples of Mordenisme architecture, seemingly sculpted from the stuff of dreams (Gaudi's masterpiece of a family home, Casa Batlló is well worth a visit). If a trip on the Passeig hasn't convinced you of Gaudi's genius, a visit to La Sagrada Familia Cathedral will do the trick; this fantastic, soaring marvel will live on in your memory long after you've returned. Not far from the Passeig and just north of Las Ramblas, the Gothic Quarter (the Barri Gotic) provides an abundance of shopping opportunities for all tastes, and a bit of European history to boot - check out the tranquil Cathedral of Barcelona. To see a bit of local life a visit to a food market is a quick, fun detour: try Santa Caterina near the Cathedral or Mercado de La Boqueria, right off of Las Ramblas. Barcelona's food is also a highlight: stop into a tapas bar and try a variety of delicacies. "Standard" restaurants of every style are available, too. And, there's music, too! Visit an underground jazz club or the magnificent Palau de la Música Catalana; or stop by the Palau Dalmases for a stunning, flamenco performance (it's near the Picasso museum). Did we mention art? One of the largest collections of Picasso's art is found at the Museau Picasso, and a great collection of contemporary, figurative (i.e not abstract) painting and sculpture is housed at the European Museum of Modern Art just around the corner. It's probably clear by now that you really can't get it all done in a day (even if all means "just the must-sees"). So, stay for a day or three in the Gothic Quarter or near Plaça de Catalunya and really get a feel for what makes Barcelona such a wonderful place. Partly it's the result of the "accidents" of its history and present: as the regional capital of Spain's prosperous Catalunya region, Barcelona has a "flavor" that is a bit of a mix between Spanish and French (it's located quite close to the French border). Yes, you can practice your Spanish here - it attracts Spaniards from throughout the country - but you'll also see and hear Catalan with it's own charm. You won't regret you time here. Palma de Mallorca, Balearic Islands, Spain - Floating gemlike off Spain's Mediterranean Riviera, these islands offer you pearls, pottery and perfectly sublime sandy beaches. Visit Valldemosa, where George Sand and Frederic Chopin spent a romantic winter in 1838. Marseille, France - Marseille offers an unexpected view of a mosaic of buildings and National Heritage Sites from the terraces of Notre-Dame de la Garde Basilica that towers above and watches over the city. Alongside the port the towers of Saint Victor Abbey house crypts that already existed when Christianity was introduced into Provence. The columns of the Palais de la Bourse, the noble facades of the Prefecture and the fountains of the Palais Longchamp are part of the triumphant architecture from the 19th Century that is scattered throughout the city and that gave Marseille renewed splendour. In the old quarter the houses are built on the sunny slopes ; the clock in the Accoules Bell tower, which was the old Sauveterre tower, still marks the hours of life around the Town Hall, while beyond the dome of the Vieille Charite hospice, Pierre Puget's masterpiece, stands out against the sky. The small streets of the Panier quarter lie a little further on. La Spezia, Florence/Pisa Italy - In Florence view the timeless treasures: the lofty Duomo, Giotto's bell tower, Michelangelo's David, the Uffizi Gallery, Ponte Vecchio over the Arno. In Pisa, see the famous Tower, still standing, if crookedly, after 650 years. Rome (Civitavecchia), Italy - Rome, Italy’s capital, is a sprawling, cosmopolitan city with nearly 3,000 years of globally influential art, architecture and culture on display. Ancient ruins such as the Forum and the Colosseum evoke the power of the former Roman Empire. Vatican City, headquarters of the Roman Catholic Church, has St. Peter’s Basilica and the Vatican Museums, which house masterpieces such as Michelangelo’s Sistine Chapel frescoes. Naples, Italy - Capital of Southern Italy, the largest city of Campania, Naples is the third most populated city in Italy (after Rome and Milan), with over a million inhabitants, and is the most important industrial center and trading port for the South. Naples itself can provide a day's fun and entertainment, if its somewhat rundown appearance doesn't dissuade you. Or, join a tour of incredible Pompeii, frozen in time since A.D. 79 when Mt. Vesuvius brought an end to that then-thriving city. 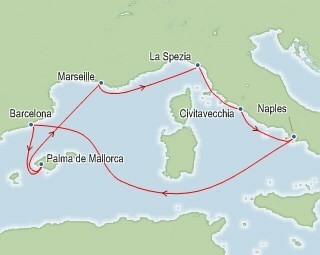 Or, take a quick ferry across the bay to the flowery Isle of Capri. Or, (yes, there's more) visit fabulous Sorrento, vacation spot for the well to do. independently of those offered by the cruise line.